Late fall in the Wasatch means taking whatever weather mother nature throws at you, and making the most of it. I started this particular story at the Utah Snow & Avalanche Workshop. The conversations inside where everything snow, but the hot sun outside was in severe contradiction. So much so that I would be taking out the mountain bikes with my appreciative bike loving wife. Only a week later though and I would be entertaining rumors of a beastly storm named, Brutus. Brutus would quickly bring snow back to the topic of my conversations, and the front of my mind. ^Pictured above is the Telemark Skier booth at the avalanche workshop. It was good to catch up with a lot of folks I haven't seen in about six months or so. We were signing up subscriptions all over the show too. These are good folks to have on our subscriber list also. They are all true professionals and advocates of our sport and mountains. ^This is a photo of one women who is very happy to be getting out on her bike. My wife loves to ride, but I've been itching for snow. However, in the Wasatch you can be on a mountain bike one day and on skis the next. Therefore, I was not too upset to be chasing my wife around on a bike under a beautiful blue sky day in the foothills. All good in my book. ^Christine ascends the hill on the right-side of this photo. The scene of fall was just fine and dandy with me. I was enjoying a nice warm day on the bikes with my lady. I knew full well that it fall could be over with at anytime. All it takes is one big storm, and winter moves in for the season to stay for a while. 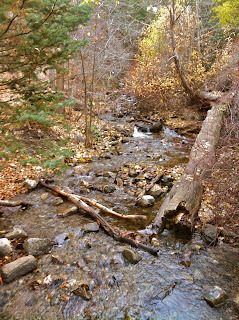 ^The creeks were running cold with the snowmelt from the early October snow storm that quickly retreated under the hot fall sun. By the time of this photo, well into the first week of November, only the shadiest slopes at high elevations retained any coverage. 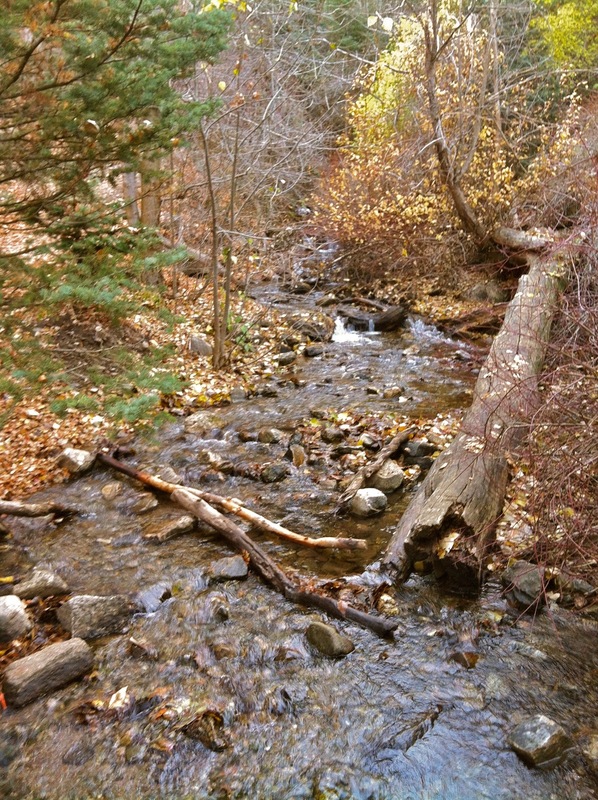 The rest of that October snowpack was trickling into this creek. ^I hit up the voting polls, and waited for a new president as well as new snow. A storm was on the forecast, and looked like a promising lineup. As the electoral votes were being counted the rumors of big snows were also adding up. By the next day everyone was talking about Obama, but my mind was on Brutus. 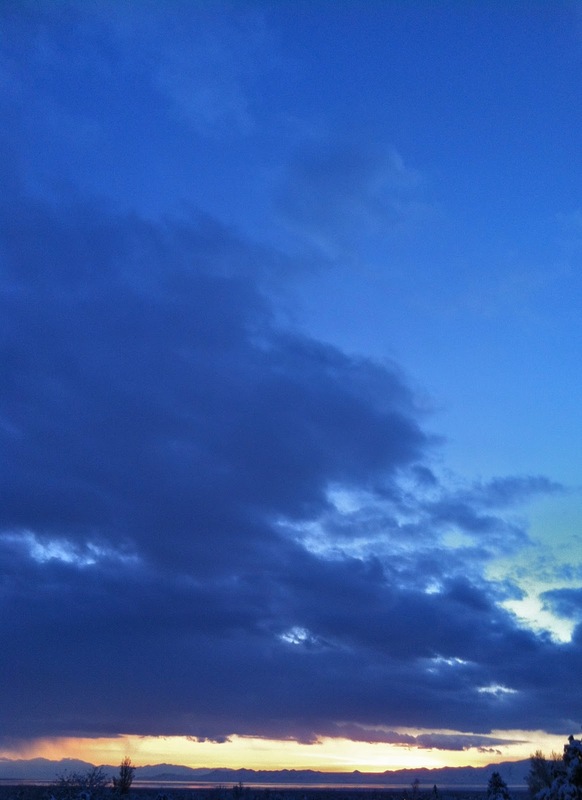 ^The cold front moved in late Thursday night. By the time I awoke on Friday morning the seasonal shift was in full swing. Outside my window was a winter wonderland. The same pathway that I rolled my bike down to my car a few days prior was hiding under eight inches of snow. The same kid that was blowing leaves off that sidewalk a week before was now shoveling snow from the same sidewalk. Unfortunately for myself, I was unable to get up into the mountains to check out the storm. By Saturday my good friend, Ben Geiger, and I had been going back and forth about the snowpack for two days as he sent me photos and correspondence from his solo tours inside of the storm. 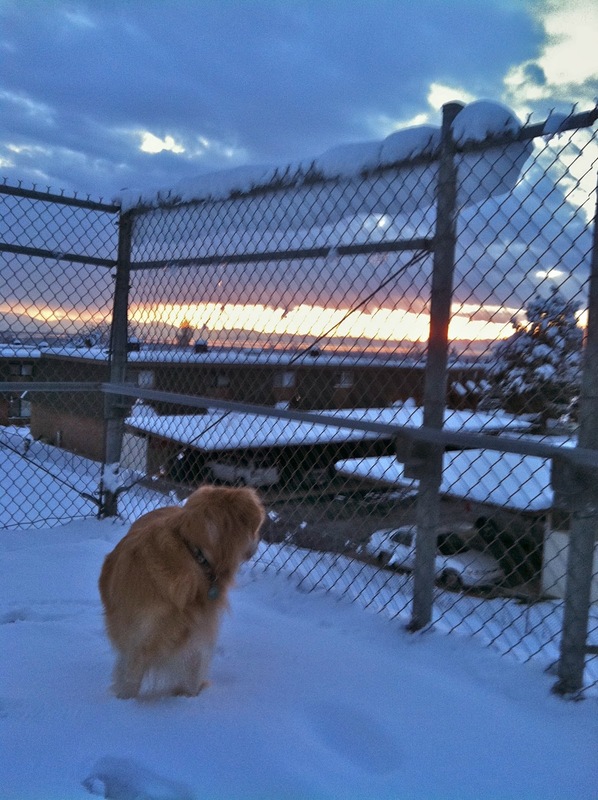 ^Brutus finally began to clear out on Saturday. Ben sent me this photo of his last cautious tracks in the early season snow coming into view with the break up of the storm. The coverage looked good, but you could still tell that it will be some time before it is a green light. The avalanche conditions were ripe, especially in the higher elevations. Ben was treading lightly in fear of the white dragon. The northern Wasatch was not experiencing as much rotten faceted basal snowpack as the central Wasatch because of the difference in elevation. The higher central Wasatch was reporting vast and drastic avalanche activity above 9,000 feet. The northern Wasatch tops out at about 9,700 feet so the basal snowpack actually went isothermic in the heat rather then faceting out. Most of the activity that was taking place just to south of us was on northerly slopes above 9,500. 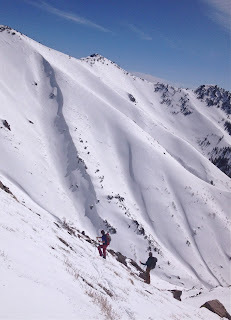 Ben reported some natural avalanches in the northern Wasatch's highest peaks due to some windslab formation, but he could not find any evidence of facets in even the highest northerly terrain up in our neck of the woods. 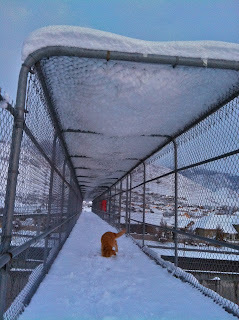 ^...which was walking under a pedestrian bridge that was primed for a different kind of avalanche of snow. 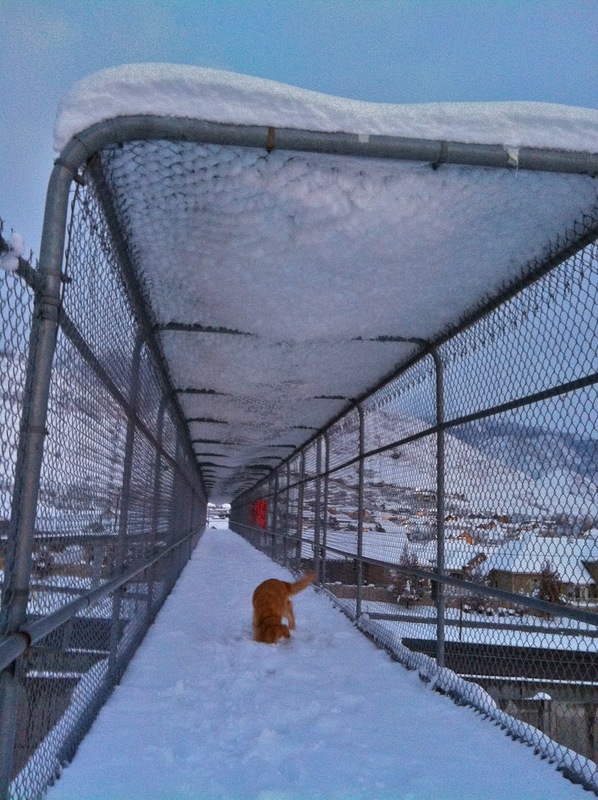 This tunnel of hanging snow probably would not hurt me, but it would fill my jacket with an unpleasant surprise. Murphy was not afraid, but she is covered in fur. Just like Ben was backing off suspect slopes up high, I backed off from walking under this hanging slab of whitewash. It might have given some passing drivers a good laugh to see this whole load of snow come down on top of me, but I figured that I would spare them the hilarious distraction. We turned around. 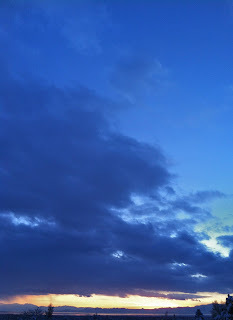 ^Walking back home I stared up at the last clouds of the storm stretching out across the valley. The mountains were wringing the last flurries out of Brutus as it departed the Wasatch to move across the Great Plains towards the Midwest. My mind was still going through all of my conversations about the new snow, and how my weekly operations in the high country would play out. The week of bikes followed by the weekend of Brutus has brought the big shift that will place me at the beginning of another wild and crazy winter. One that officially kicks off this week. Here we go!